Nirmukta’s Bangalore chapter, the Bengaluru Freethinkers, participated in this year’s Bangalore Pride Walk on Sunday, 24th November. 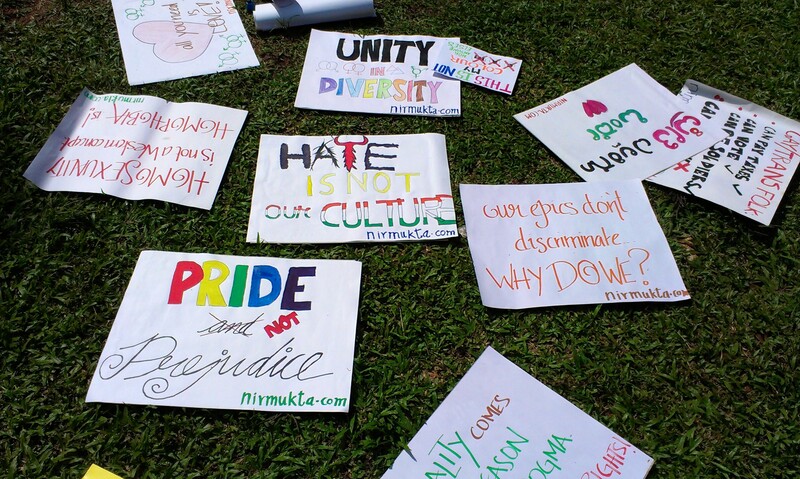 The Pride Walk was the culmination of the three week-long Karnataka Queer Habba, which included events like protests against the Hassan arrests, a transgender day of remembrance, film screenings, theatre performances, a marathon and a diversity fair. 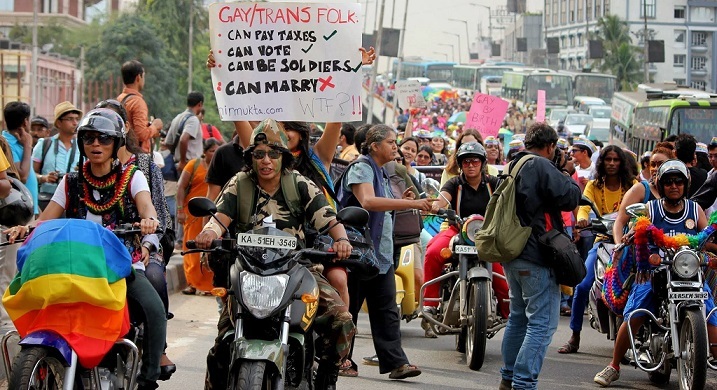 This was the sixth pride march in the city, and saw attendees not just from Karnataka but other states as well – this news report puts attendance at 1,300! Here’s another news report. The march kicked off at 2pm from the city railway station, and proceeded through about six kilometres to the Town Hall, with helpful police officers guiding us through the traffic. It was led by was led by Dykes on Bikes, an all-woman motorcycle contingent. It was a fantastic experience; people shouted slogans and danced in the rain. Events like this are a necessary reminder of the work that needs to be done, and for us at Nirmukta to reaffirm our commitment to secular humanism. Holding the banners aloft on the steps of the Town Hall. Photo by Merina Morris. A shot taken from the front of the march, with the Dykes on Bikes leading the way and the procession following behind. Photo by Merina Morris. You can find more photos of the march here (Facebook album). The victim, identified as Vamshi Raju, was a resident of Yeshwanthpur near Mathikere and a final-year engineering student. 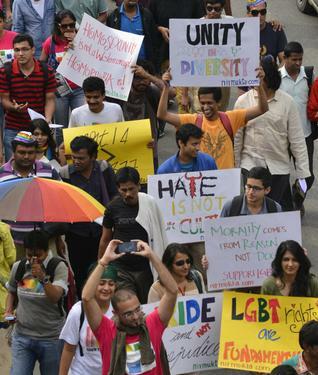 “Raju danced openly at the Pride Rally on Sunday and it was aired on TV. His family saw the visuals in the evening news, and a big fight broke out between the victim and his parents when he returned home from the rally on Sunday night. Unable to bear the rejection from his family, a depressed Raju committed suicide,” said human rights activist Manohar Elavarthi in a press release. Such a tragic loss and a reminder of how far we have to go still. Sunil D'Monte is a freethinker, feminist and secular humanist. Congratulations for organising this LGBT event! Please see my (armchair) suggestions in a positive light. However, the setup seems elitist and focused on middle-class and higher economic strata. It would be well to attract the masses if it is to form a mass movement. Please make more posters in Vernacular. English is understood by very few people! Being bilingual is key. It would be good to keep epics (I mean Hindu religious epics) out of the picture. They may or may not discriminate on the basis of sexual orientation (I believe they do), but that opens the door for more and more Hindu texts that *do* discriminate. There is a subtle Hindu bias in such slogans. Of course, there is active and strong homophobia in other religions, so you should go out of your way to support those Muslims and Christians who want to come out. Why not include (or at least try to include) the indigenous Trans- community (called “hijra” or “kinnar”)? They are among the most marginalised, superstition-ridden community in India, and including them would serve two purposes: their marginalisation is highlighted and thus hopefully on the road to elimination, while simultaneously there is awareness that this is not a “Western” cultural fad. Many people are suspicious of anything “Western” (while using computers and the Internet), but everyone is aware of Hijras being a part and parcel of Indian society since Antiquity. I apologise for my use of the term “Hijra”, and would very much like to use another word if anyone from that community can provide it. The middle-class LGBT movement does not have a strong sense of identity and community. This is an important lesson to be learnt from hijras. A strong community and support structure can help prevent unfortunate deaths like that of Mr. Raju. I find Fayyad a lot more credible than his detractors here on MW. That’s pretty hyperbolic seeing as none of his detractors would have blocked the Goldstobe Report at the UN orsold out the Palestinians as per the Palesrine Papers. He is trying to end the military occupation that began in 1967 through some very smart political moves.Perhaps. Time will tell how smart they were. The fourth photo is AMAZING! Absolutely love it. So what do you do to achieve the light-trails effect? I’ve tried getting the circular ones by jerking the camera (sort of like you would the steering wheel in one of those “driving” video games) as you press the shutter, but I’ve never had much luck with it. Also, what flash diffuser do you have? Caddy's World is a wonderful addition to a marvellous series…but I don't like this cover, just as much as I didn't like the cartoony covers. Ignore it, and read the book anyway. You should have put this sign up. Neither are heterosexuals because heave doesn’t exist.